What produce does elicit disappointment in summer, is usually met with much gladness in the dearth of winter. 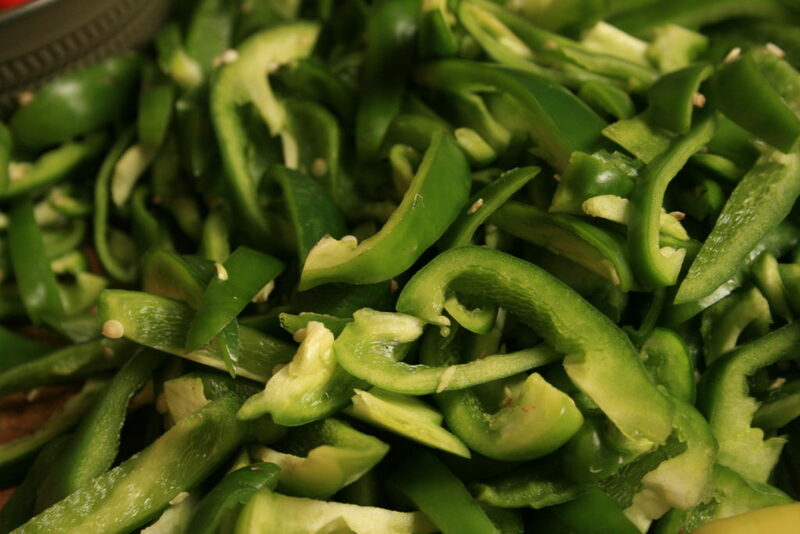 Take, for instance, the green bell pepper. Many, many sweet peppers usually remain on my plants until the first Fall frost comes rolling in. 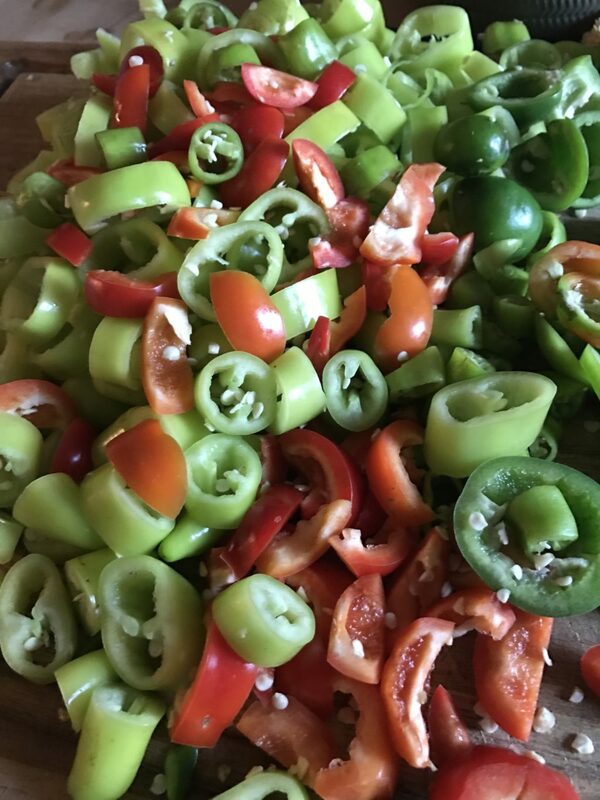 I need every single day of sun and warmth I can get to turn that green pepper into its sweeter companion, the much worshipped, Red Pepper. This year was particularly in want of red sweet peppers. If we did get one, it was gobbled up by an eager little five-year-old before it made it indoors! I actually never tasted a red pepper this time around. Oof! The experiment with new pepper varieties was no good, and all that rain we had did not help the pepper cause, either. 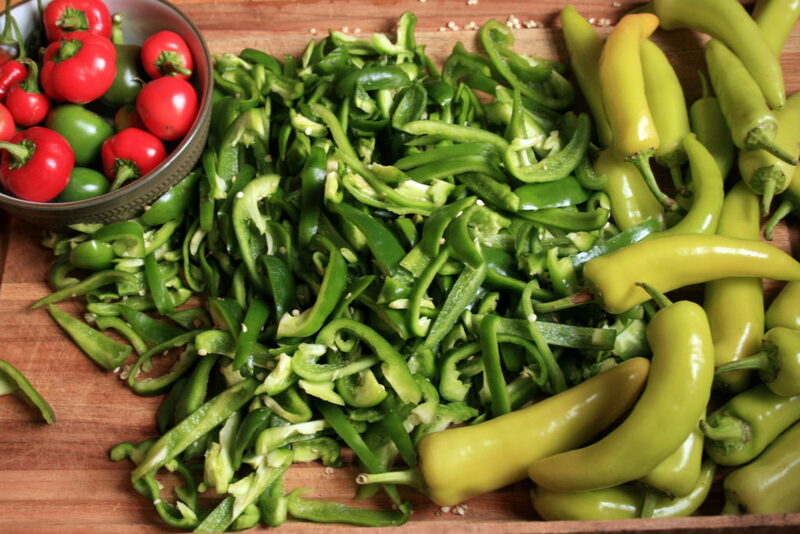 So when that Fall frost did arrive a few days ago, I had a mighty load of green peppers to put up for winter eating. …and spread them out over a tray of some sort, then pop it in the freezer. When they are all frozen, I toss them into a resealable baggie so I can grab handfuls out for cooking as I need. So easy, delicious, and much easier on the pocket book than those $5 sweet peppers you might pick up at Whole Foods all winter. I had a bit of hot peppers to put up today, too. 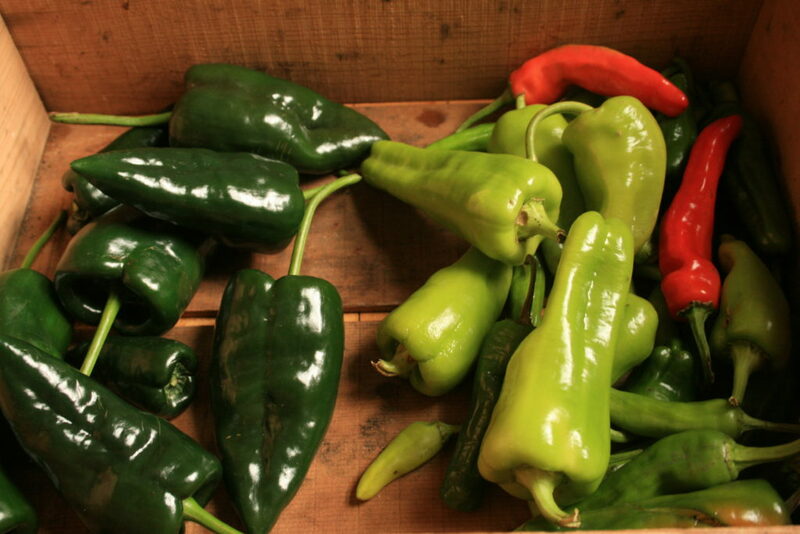 It was a much better year for hot peppers than those red sweet peppers, apparently. 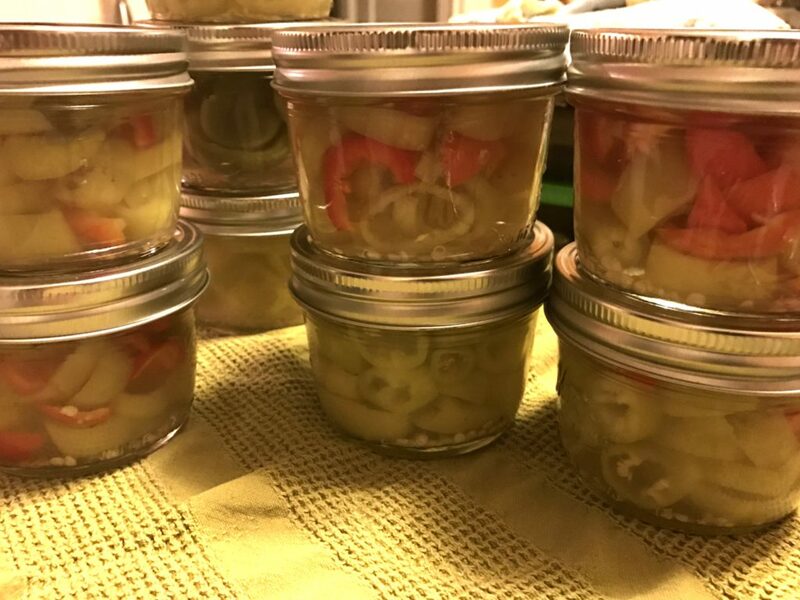 Even after canning 24 pints of salsa and nine pints of enchilada sauce, plus eating and giving away plenty, I had a good smattering for pickled peppers! I like to core and slice them into smaller pieces so we can serve them right out of the jar for a taste of summer. I used the same brine that I give a recipe for in this post. The ratios are 2 c vinegar : 1 c water : 2 t salt. After processing pounds and pounds of Poblano peppers, there is just one little stack in the harvest box left. Chillis rellenos perhaps? Maybe a few will become dried anchos because I can never have enough of those in the winter. The rest are Cubannelle and Padron peppers that are sure to make it into the frying pan in the next couple of days. If you have a good deal of frying peppers to put up, they do beautifully roasted in the oven, or pan fried, then frozen whole. Happy pepper processing! What are you working on putting up for the winter?